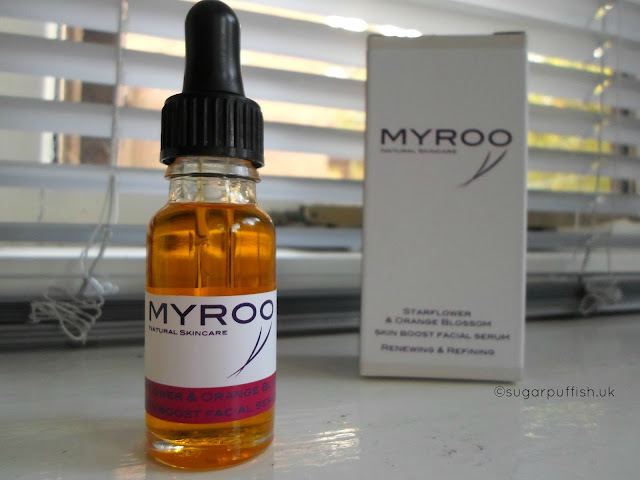 After reviewing Saaf serum I was contacted by Myroo Natural Skincare. They asked if I would consider reviewing starflower & orange blossom skin boost facial serum. Myroo is an independent UK company producing natural bath, body and facial products. There are no parabens, SLS or palm oil in the range (“We only use synthetics where they are unavoidable, for example to preserve"). Products are not tested on animals. Myroo's face serum is suitable for all skin types. My skin is dry all year round so I have learnt that an oil provides a much needed moisture boost. As with other oils I have tested, I like using this as an overnight treatment. I can be generous with the amount I apply and by morning my skin has absorb the serum. In the morning my complexion looks healthy, my skin is smooth and free from dry patches. I find I need to apply less day moisturiser and my make up sits better on my skin. Compared to the Saaf serum, this has a delicate fragrance. It reminds me of a spring day, the freshness of light florals and cut grass. The packaging is convenient and fit for purpose, having a pipit to dispense the serum is ideal. I find it easy to measure out two or three drops which is sufficient for my skin (a little goes a long way). Face oils are surprisingly versatile and easily slot into your daily skin routine. For instance, if you use a light day moisturiser and experience dryness rather than switching to a heavier cream you could add a drop of face oil. Another tip is to use a facial oil under a clay mask. The idea is to benefit from the oil under the mask and you should find the mask is easier to remove. I know some of you may shy away from oils but I urge you to give them a try. I highly recommend this one based on performance, company ethics and price point. I honestly can not find fault with this product. I recommend you take a look at the other Myroo products which include Bath Fizz, Bath Soak, Body Scrub, Body Butter, Lip Balm, Hand cream and Cleanser. Have you tried Myroo products? What did you think? Do you currently use a face oil/serum in your skin routine? I hadn't heard of this brand before but they've got some lovely products - I especially like the look of the body scrub.